Ross Dunbar Shardlow writes about the last ship to carry convicts directly from Ireland to Australia. Of the thirty-three ships that brought convicts to Western Australia between 1850-1868, renowned British shipping magnate, Duncan Dunbar, owned twelve. One of these ships, the Phoebe Dunbar, was built in 1850 to replace one of Dunbar's earlier vessels, the 578 ton Phoebe, built at Sunderland by James Laing in 1842. Laing also built the replacement full-rigged Phoebe Dunbar - in fact, he built one or more ships for Dunbar every year for twelve years. At 704 tons, the new Phoebe Dunbar was a little larger than her predecessor and measured 131.1 feet by 29.4 feet; about the same as the Leeuwin; but considerably deeper, with a depth of hold of 21 feet. A square stem, quarter galleries and a guiding figurehead of Phoebe herself, made for a perfect model. Phoebe Duncan Dunbar was the daughter of Duncan Dunbar the elder, sister to Duncan Dunbar the younger, wife to Edward Dunbar-Dunbar, the regimental captain, and heir to the Dunbar estate of "Sea Park". Sea Park, coincidentally, was the name given to another of Dunbar's ships - he had seventy-five ships all told, and all sailing ships. Sea Park was built in 1845, also by James Laing, and transported convicts to Western Australia in 1854. The drawing depicts the Phoebe Dunbar in Gages Roads hove-to to receive the pilot - the luckless Henry Goss commanding the Harbour Master's reefed down yawl; with the Union Flag at the main and the white-over-red pilot flag at the peak. The Phoebe has her pilot jack at the fore to call a pilot, the Dunbar house flag at the main (though she was under charter to the Admiralty at the time) and from the mizzen, she is flying the code flags 6-8-4-2 over a second distinguishing pendant - Marryat's code for Phoebe Dunbar. Phoebe Dunbar (lovingly referred to simply as Phoebe by the Dunbars), left Dunbar Docks in London on 4 July 1850 on her maiden voyage, bound to New Zealand with emigrants. Her next run to the Antipodes was to Port Adelaide arriving 7 June 1852. 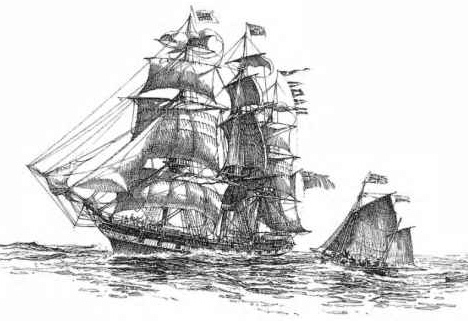 It was in 1853, however, that she earned the title of being the last ship to carry convicts directly from Ireland.Leaving Kingstown (now Dun Laoghaire) near Dublin, on 2 June 1853, Captain Forbes Michie made a fine run of 89 days direct to Fremantle, arriving at Gages Roads on 30 August 1853. Phoebe had on board 93 passengers (all Pensioner Guards and their families) and 286 male convicts - including the nefarious malefactor, John Lahiffe, transported for seven years for robbery and larceny. Of the thirty-seven shipments of convicts to Western Australia, it appears Phoebe Dunbar had the highest death toll. Sixteen deaths were recorded on board during the voyage with another three more dying soon after arrival. Typhus, cholera and a fractured skull were given as causes, and not all the deaths were confined to the convicts, as attested by the passing of Phoebe Dunbar McKay, born at sea to Margaret and John McKay of the 26th Regiment, and buried on arrival at Fremantle. When Rottnest Island pilot Edward Back was suspended for a month for "inattention", Henry Goss was examined and assigned Second Pilot to stand in for him. Having to use the Fremantle Harbour Master's large sailing boat (Back had recently capsized and "very much damaged" the Rottnest whaleboat - with the loss of two men), Pilot Goss soon found himself in difficulties, collided with the Phoebe and carried away the bowsprit of the Harbour Master's boat. When Mr Goss grounded the barque John Panter on Scotts Ledge a few weeks later, the Harbour Master felt it prudent to discharge Goss from service as a pilot. The Phoebe wasn't doing a whole lot better; she ran onto the Success Bank but managed to get off without too much concern. Phoebe Dunbar's next run was from Plymouth to Melbourne with 270 Government Emigrants and a cargo of spirits, arriving Christmas Day 1854. In 1856, she made her next emigrant run, again from Plymouth with 268 emigrants and four passengers, but this time to the Moreton Bay Settlement in Queensland (Brisbane), where she arrived on 23 May 1856. Happily; Phoebe Dunbar Marshall, born at sea on this voyage lived until 1941. Not so lucky was the Phoebe Dunbar: Coming into Moreton Bay in hazy weather, the captain mistook Point Lookout for Cape Moreton and was obliged to attempt the hazardous South Passage, inevitably running ashore before making Amity Point. Local steamers 'Breadalbane' and 'Sampson' refloated the Phoebe and transferred the passengers to Brisbane; but Phoebe was so badly damaged, including the loss of her rudder and two anchors that her pumps could not sustain her and she was deliberately run ashore inside the Bay near Dunwich. In the attempt to refloat her, one seaman was drowned and another had his arm broken. Patch-up repairs eventually allowed her to be refloated enabling her to make her way down the coast to Sydney where thorough repairs could be effected. On the 7 March 1864, Phoebe was lying in Newcastle harbour (NSW) when the awful call of "fire on board" was reported. Desperate efforts by the fire brigade to stem the blaze proved futile and the steam tug Tamar was brought in to tow her out towards Scotts Point with the hope of scuttling her: but so ferociously was her wooden hull consumed, she was soon razed to the waterline. Several injuries were sustained in the determination to save her but no lives were lost. Her remains were sold off for £97.15s shortly after - so ended the Phoebe Dunbar. Not so Mrs Phoebe Duncan Dunbar-Dunbar - she lived to 9 May 1899. This excellent article, accompanied by a sketch of Phoebe Dunbar, appears in Voume 15, No.4, December 2004 of the Maritime Heritage Association Journal, edited by Peter Worsley of Mandurah, Western Australia. Ross Dunbar Shardlow: Fellow of the Australian Marine Artists Association.